Okay, I admit it…. DieselDave, you were right…. That knocketa-knocketa-knocketa sound…. The quietness of Wally’s engine, the apparent lack of power…. Had a minute tonight so I thought I’d just go pull the head off Wally as a start to the teardown… Took out the third head bolt, oil came out with it…. Ring gap fairly far out of spec… BIG clue! 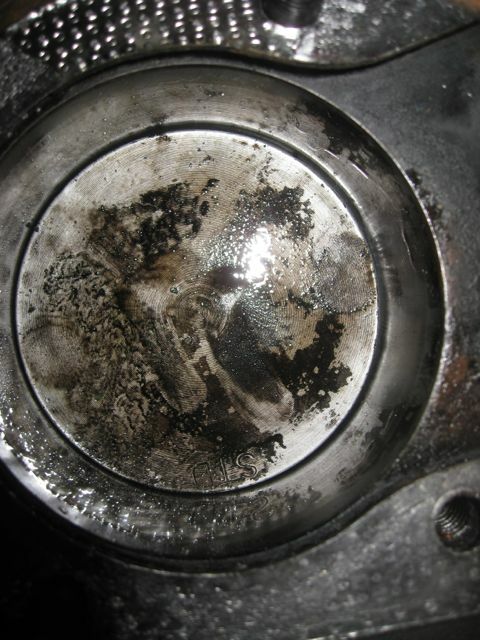 Not sure why I couldn’t see this when I dropped the piston in, and I don’t think this is something that happened SINCE I started working on the engine… Could THAT MUCH out of round happen in, maybe 15 minutes of run time, even with the possibility of honing grit in the cylinder? I’m not too impressed with the engine rebuilders that I took the block to… The ones who said it was in spec… Then again, you get what you pay for… And I guess a 5 minute look by them for free was worth every penny…. Suggestions and condolences are welcome… I’m going to bed now…. This entry was posted in Wally. Bookmark the permalink.